Before eventually realizing the error of my ways, I was perfectly content with buying very cheap keyboards and burning through them once they became too dirty to deal with or simply broke. As someone who plays PC games and generally does a lot of typing, I clearly wasn't looking at this buying situation from a long-term perspective. That changed when I picked up a Das keyboard and experienced the joys of regularly using a well-made mechanical keyboard. While I'm a big fan and it still gets the job done to this day, those keyboards admittedly don't offer the kinds of functionality that other models do. 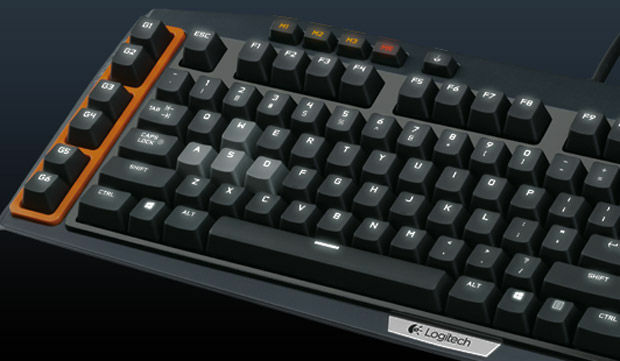 The Logitech G710+, on the other hand, is specifically geared toward gamers. With its approach to illuminating keys, you'll never lose track of WASD when playing late into the night. Oh, and yes -- it feels pretty great to type with. Once you get properly acquainted with a mechanical keyboard, the device becomes an extension of your hands and fingers. The lack of resistance required to press down individual keys means you can in all likelihood type faster than you'll be able to think up cohesive sentences. For gaming, particularly when it comes to competitive titles, input speed can obviously be the deciding factor. I'm no would-be professional gamer, but I did test out the Logitech G710+ for a solid couple of weeks as my primary input device. The first noticeable difference was that this keyboard isn't nearly as loud as others are, particularly the Das line. It's by no means quiet -- it is, after all, mechanical -- but those of you who are turned off by the general noisiness of these products likely won't be quite so distracted. The people around you will probably appreciate it as well. The sound dampening doesn't seem to come at the expense of responsiveness, as the G710+ feels very light to the touch. For those of you with a specific preference, know that this keyboard uses Cherry MX Brown switches. 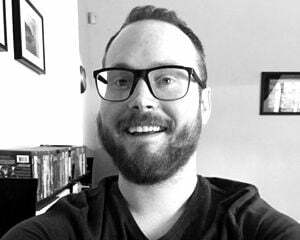 Personally, I don't have an exact preference and tend to adapt after the first ten minutes of use. In general, this keyboard felt immediately comfortable. During my time, I also had zero issues with incorrect key rollover or other input-related funkiness that can sometimes crop up. At first, I didn't expect to find the keyboard's backlighting particularly useful. It wasn't long before I came to appreciate the white LEDs -- to the point where I now feel obligated to leave them set on the highest brightness level at all times. Even in my absurdly bright office, it makes reading keys somewhat easier during the occasional times when I need to glance down. Interestingly enough, the WASD and arrow keys have their own brightness settings which are separate from the rest of the keys. If you wanted to, you could have everything else turned off while leaving those on full brightness. One complaint that I could see people having is that, even on the brightest setting (of which there are four, plus "off"), the keys aren't actually all that bright depending on your room's lighting. This didn't bother me so much, but I couldn't help but notice it nonetheless. Additionally, there's a game-mode key which disables the Windows / context-menu keys when enabled; media controls (play/pause, skip, mute, etc. ); and a rolling volume control that's far more fun to use than it has any right to be. A lone USB (2.0) pass-through sits at the top, right next to the keyboard's USB cord. I'll go ahead and admit to not even knowing about it for a few days. While it worked for my purposes (wireless headphones), the placement might be awkward for certain devices. 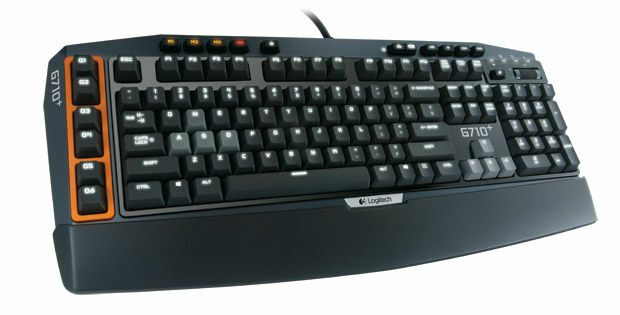 The G710+ includes six programmable "G-keys" on its left-hand side that, when used in conjunction with three different modes, can perform 18 separate functions. I found these keys to be within reasonable reach but not so tightly packed in that I inadvertently hit one of them instead of, say, the Esc key. The software used to set all of this up is fairly intuitive and minimalistic, thankfully offering a decent selection of suggested commands to choose from. Of course, you can get totally crazy with this and make your own involved script for keys if that's what you desire. Lastly, there is a detachable wrist rest that becomes rather useful due to the keyboard's height. It's not the most comfortable thing I've set my wrists on, but it is adequate, and its shape complements the device's overall aesthetic, which looks nice -- except for the fingerprints that will surely ensue. All told, I really enjoyed using the Logitech G710+. There's solid performance to back up the stylish look of this keyboard, from the vibrant orange finish to the sleek body angles to the white LED backlighting. If I were out looking for a replacement mechanical keyboard with reasonable game-centric functionality, this would be a serious contender, even at $149.99.